Edited to add: I am using the 64bit version of DazStudio ... do I really have to install the 32bit for the bridge to work? You are doing it the wrong way round, you don't send it from Daz Studio to Bryce, you imort it into Bryce from Daz Studio. Close DS Open up Bryce, and click on the DAZ 3D icon on the top line right hand side. Chohole, I could be mistaken but it should work just fine the way Kerya is using it. You should be able to start DS4 first, then use the send to bryce tool and a new instance of Bryce should be opened that is linked to the current ds4 instance, your content should then show up in Bryce as expected. There is indeed something fishy going on with the Bridge. Here's how I understand it so far. When Bryce 7 was released the only DS version available was DS 3. When DS4 was released Bryce should have been updated but it wasnt. So that has led to a problem with the registry. In the registry there are keys that tell Bryce 7 to search only for DS 3 and from there it is redirected to DS4 with proper updating. When DS 4 was first released users had to manually update the registry. Perhaps with DS 4.5 pro this is automatic with installation. Not sure. In your case manual will be best. Just like you I get a dropdown menu that is blank, because Bryce 7 for me still thinks it is launching DS 3 when really it launches DS4. But the bridge operates fine for me. In my own case, to get the bridge to DS 4.0 working I had to fiddle with the registry keys. Scary stuff. But doable and seems to still function with DS4.5. So in case I've been unclear let me state it better. Bryce 7 is not programmed to look for DS 4 or 4.5. Bryce 7 is hard wired to DS 3. Because of this the user must manually edit the registry keys so that the link is redirected to launch DS4 or 4.5. Even if you have never installed DS 3 on your system, the DS4 installer still adds registry keys for DS3 with redirect instructions to DS4. The bridge cannot function otherwise. The sequence the software is installed matters a lot in some cases but perhaps not all. In my own case I already had Bryce 7 installed, and had originally been using DS 3 when DS 4 came out and had no problems with the bridge to DS4. But then I switched operating systems and had to start over on a new system that had never been exposed to a DS3 install. What I found was that the bridge to DS4 required me to add DS 3 keys even though I did not have need for DS3 on my system. So systems that had previously been exposed to DS3 did fine with Ds4 as well. It was the systems that had never seen Ds3 that had bridge problems to Ds4. However there are other people who may have installed DS 4 first and then Bryce 7 afterward. I honestly do not know if installing Ds 4 first or Bryce first will bring about the best results. Either way Bryce 7 is still hard wired to seek DS 3 instead of Ds4. As stated above the newest DS4 installers should know how to update the registry to include the necessary keys to create an operation bridge. But I'm not holding my breath on that one. Here's what I can do. I will provide you a link to the original thread in the old forum that explains how to do this. To see the images attached you might need to use Grease Monkey's script that displays the old forums properly. The information you need is provided as an image by a user named Steve Athome. See the archive thread below. Hope this helps. Im surprised more people dont run into this problem, it was a big one for me. Best of luck. I have the same set up as you and every thing works fine . DS to Bryce and DS to Hex . You could try adding DS 32 bit - I do have that installed also . Might help . Bryce must be installed first, Studio last. If Studio is already installed, install Bryce and re-install Studio over the existing installation. I have never had to fiddle in the registry. The picture shows that I have several installations of Bryce and Studio and all worked from the first moment. Bryce 5.5 launches Studio 2.3 directly. Bryce 6.1 launches Studio 2.3 directly. Bryce 6.3 asks which Studio I want to launch, 2.3 or 3. Bryce 7.0 asks for Studio 3 either 32 or 64 bit. Bryce 7.1 asks for Studio 3 or 4 - with 3 it launches 3, with 4 it launches 4.5. I don't know why it doesn't work for others the same way. Yes, Horo. You wont have a problem with any of it because you already had DS3 installed before you installed Ds4. It is for users who have never installed DS3 that this problem arises. Ah - didn't know that bit. Thanks Rashad. Here is the thread where Steve first solved the mystery of the registry failures. This thread should jog the memories of both Chohole and Horo. And just in case you are unable to view the images in the archive I have re-uploaded them with Steve's original instructions. There are two places to make registry edits, both on the DS side and the Bryce side. Remember that if any of the keys are missing you will need to create them. It seems that creating our own DS3 keys, while effective for the basic function of the bridge, seems to break the function of the drop down that should list which version of DS are available. For me I get nothing on the drop down but because of the registry edits it still starts DS4.5 for me. For me this issue of the registry problems breaking the Bridge to DS4 is just as important as the side by side configuration error. It's probably a good idea to add this information in a sticky. Its a bit embarrassing that we have to edit the registry this way to use DS4 simply because Bryce hasnt been updated in over 2 years. ARGGGH! I poked around a bit more - it seems to have to do with me using a restricted account most of the time. I changed to being an administrator and then I DO have those registry keys and all bridges are working. Starting regedit as a user, I do get the first picture, as an administrator the second. How do I create that line with InstallPath as a user? OK, it is Stringvalue (Zeichenfolge in German). Created install paths for DS3 (just used my path to DS4) and in DS4 and in Bryce7 and - wow ! Working bridge! I don't have DS 3 installed . Perhaps you dont have it installed anymore, but you might have had it installed in the past. Even if not the Ds4 installer still creates DS3 keys because the Bryce 7.1 Bridge requires them. If you check your registry you will likely find DS3 keys and if not then that would surprise me. However, I am not an expert on this but if Steve Athome sees this thread he may be able to chime in. 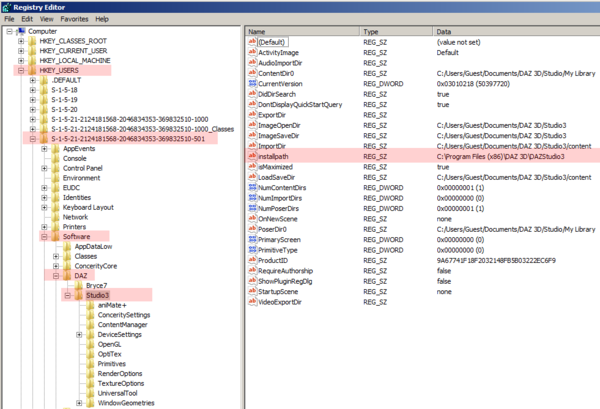 Kerya's permissions issue is a new observation and could well be the root of her problem. But do notice how after she applied the fix it did enable the bridge to operate in both admin and guest user modes, so if anything it has improved the flexibility of her bridge. But now shes got hexagon issues, no idea how to help with that but maybe it is another permissions issue. You are not wrong. No need to blush. The Bridge does work fine in DS4.5 for most people, but the issue of DS3 dependence means that every once in a while a user's registry will get a little screwed and they will have to go in and fix it. All this in my relative layman's terms. Well - my administrator account doesn't have a DS3 key and the bridge works nonetheless. Don't ask me! I am happy enough to have it working. Ah, but the DS3 key is there when you are logged in as a guest. It's probably there for all of us just not always visible. Steve Athome is a genius about this stuff, but I haven't seen him around lately but I'm sure he could make sense of it for us. Oh well. @Kerya: can't remember for sure, and it looks like I don't have Hexagon on this computer, but it's either in the dzInstall.ini file (Documents\\Application Data\DAZ 3D) or in the registry. 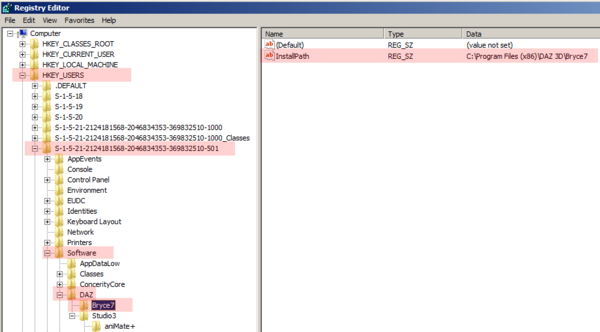 It's the dzInstall.ini in appdata - I had one as admin, but not as user. I just copied it over - and voilà! Working Bridge! 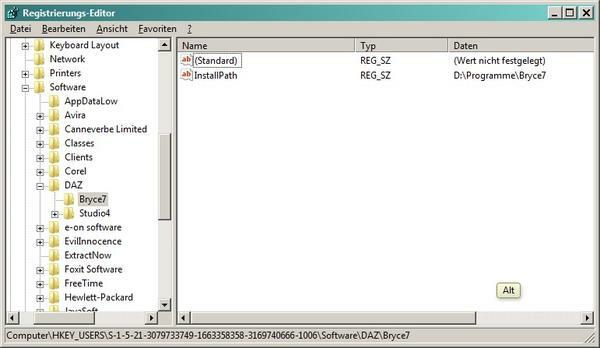 Did you add the InstallPath registry keys in the DS3, DS4 and Bryce folder? Because I've got the bridge working both ways since adding them. Does anyone know if I can just install the latest versions ontop of the previous ones, or do I need to go for the fresh install? 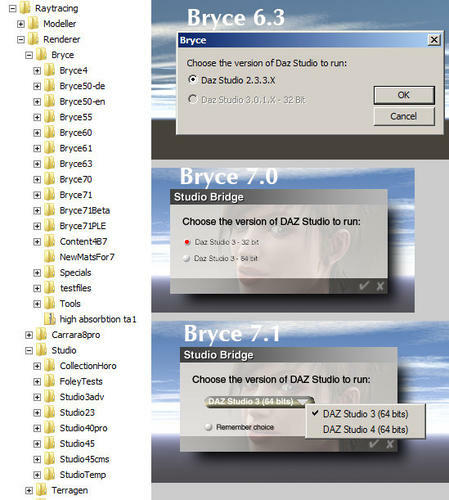 Because you say " I added the installpath keys for both DAZ3 and Bryce7" - are you sure you have one in DazStudio4? I'm not sure about Studio but if you install the latest version of Bryce over an older version it will overwrite your presets folder. So if you have alot of hard to replace custom presets you should save a copy of your presets folder somewhere else. Ehm - I didn't understand the instructions to change the install path to read Daz3 instead of Daz4 - I just added it. All with install paths and I faked the install path for DS3 and wrote the path to Studio4 inside the folder Studio3. The bridge works for me in both directions. I hope this helps (English is not my native language, sorry). That is not something I checked. Which versions of DS do you have installed? I know there can be problems due to the order in which the programmes are installed, maybe there is a specific search function on installation?. I will finish off what I am doing, then make a clean installation of the various versions of DS and then Bryce and Hexagon, then clean install them in different orders and monitor what they are doing/looking for to use the bridge.